A British climber has embarked on an attempt to make the world's highest phone call. 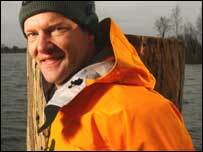 Rod Baber plans to climb Everest and then establish a world record by making a mobile call from the summit. 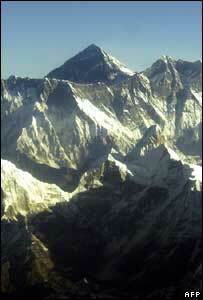 Weather permitting, the attempt to reach the peak of Everest is scheduled to take place in late May. "There's no reason why it should not work," said Mr Baber who already holds a world record for reaching the highest point of every European nation. Making a phone call from the summit of Everest has become possible thanks to a mobile base station installed in China that has line of sight to the north side of the mountain. Mr Baber was confident that the attempt on the world record would work because the phone he will use has been tested in very low temperatures and the final climb will only happen if weather conditions are good. The downside is that staying in contact with this base station demands that climbers follow the north ridge to the top - generally regarded as the toughest route. Mr Baber is travelling in an expedition organised and run by experienced mountain climbing group HimEx which, says Mr Baber, has one of the best records of getting climbers to the top of the mountain. An experienced climber Mr Baber also holds the world record for climbing more of the world's highest points than any one else. However, all his climbing has been done on peaks under 7,000 metres high. He set off for Kathmandu on 30 March and will spend the next few weeks getting his body used to living at high altitude. Speaking to the BBC News website Mr Baber said he had been in training for the Everest climb for months. "I've been running 8-10 miles a day and on the days I'm not doing that I'm doing weights and spending time on a cross-training machine," he said. To help his body cope with high altitude Mr Baber has also had to eat a lot. "I've put on just over two stone and increased my body-mass-index by 24%," he said. The reason for putting on so much weight is simply to help survive in the hostile conditions in the Himalayas. "Above 7000 metres it does not matter how much rest you have, your body just starts to break down and your organs start slowing down," said Mr Baber. "The way you compensate for that is just by putting on as much weight as you can." "Although," he added, "eating a lot, running a lot and doing weights is a strange combination." Mr Baber is sponsored by Motorola who has provided the phone he will use to make the call and send a text message from the summit. The final push for the summit usually takes 6-8 days, weather permitting, and is due to start in late May. As well as preparing himself for life at high altitude, the weeks preceding the push for the summit will be used to prepare the route to the top and to stock the camps where climbers will shelter overnight. Mr Baber will not spend long on the top of Everest, perhaps only 15 minutes, largely because conditions at that altitude (8,848m, 29,035ft) are so harsh. Taking a phone that will help keep him in touch with family and friends would help in the attempt to climb the mountain, he said. "It does not matter how fit you are," said Mr Baber, "the key reason to success is 80% psychological. Having someone you can speak to on the other end of the telephone can overturn those invisible obstacles."